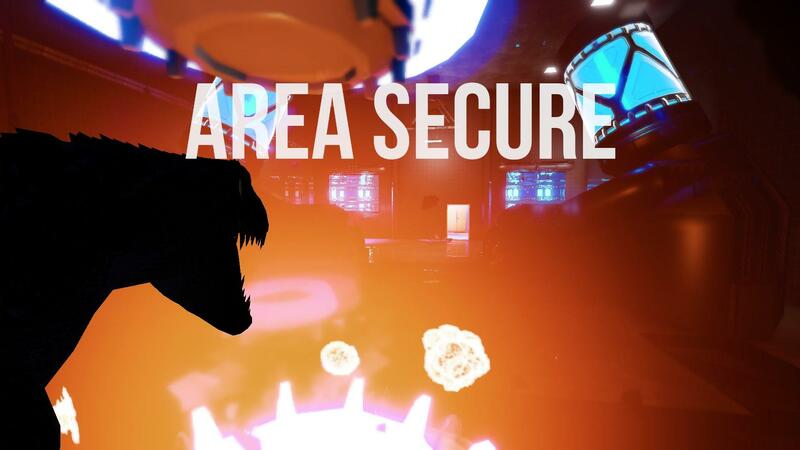 In Case of Emergency, Release Raptor is the latest game from Arcen Games, LLC and it's quite clear they needed money to make something like this. Note: My key was provided by the developer. I really like Arcen Games and I think they usually come out with rather unique and interestingly designed titles, but this is just—super bad. You're a raptor (they are aware it's not an actual velociraptor), you run around smashing up weirdly polite robots and breaking down doors. I've played a little bit of it now, as much as I can handle and it's just not good. It's an obvious attempt to win over Youtube video makers and Twitch streamers with a silly title and outrageously silly gameplay. It has only one mode right now, where you have infinite health, but it tracks how many times you have been hit by enemies. This is sad, as it feels like there's no challenge other than beating your hits from last time. The entire game just makes zero sense. I know games don't have to make sense, but come on. Silver lining: The Linux version seems to work well at least. I'm going to be honest, I wouldn't buy it. At least not yet, it's far too bare-bones and just not fun. However, if you want you can pick it up for 10% off until the end of the month. It's available now on Steam. Sadly, it's just what happened for me with No Man's Sky if I can make a comparison. Except the lack of hype, of course. From the first trailer I knew it's shallow no matter how it looks. You just can't make a good game from the material shown if you're not a pure game genius (currently their population is close to extinction anyway). Well, maybe it'll be given some depth over the time to come. I hope their most awaited game "Stars beyond Reach" will be released eventually and become a huge success! I can't wait until they release their real game Stars Beyond Reach. This looks like fodder to keep things afloat until it gets released, and is also probably a fun little side project for the devs... As working on one game for a couple years probably tends to get boring. However... I love that Arcen isn't afraid to experiment with unique ideas, and gameplay mechanics. Quote The entire game just makes zero sense. I know games don't have to make sense, but come on. Its got a good concept but I am patient enough to not buy it in early access. If they can improve it then they may win me over. I bought it and downloaded it last night, and I'll play it later today. I've been following this game since it's inception. As I recall, this whole game came about by developers messing around in-house and, having so much fun, deciding to release a version for the public. Like I said, I've not played it yet, but my expectations are in the area of the non-game Goat Simulator. I think the price reflects that the devs know full well what a silly thing ICoERR is. It's a lark, and one I hope is every bit as absurd as Liam says it is.